• Capital letters for primary winding vector group designation. • Small letters for secondary winding group designation. • D or d represents a primary or secondary delta winding. • Y or y represents a primary or secondary star winding. • Z or z represents a primary or secondary interconnected star winding. 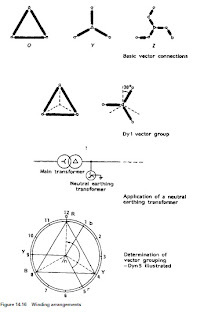 • N or n indicates primary or secondary winding with an earth connection to the star point. • Numbers represent the phase relationship between the primary and secondary windings. The secondary to primary voltage displacement angles are given in accordance with the position of the ‘hands’ on a clock relative to the mid-day or twelve o’clock position. Thus 1 (representing one o’clock) is 30°, 3 is 90°, 11 is 30° and so on. Therefore a Dy1 vector grouping indicates that the secondary red phase star voltage vector, Vrn, is at the one o’clock position and therefore lags the primary red phase delta voltage vector, Vm, at the twelve o’clock position by 30°, i.e. the one o’clock position is 30° lagging the primary twelve o’clock position for conventional anti-clockwise vector rotation. Similarly a Dyn11 vector grouping indicates that the secondary red phase voltage leads the primary voltage by 30°, i.e. the eleven o’clock position leads the twelve o’clock position by 30°. The secondary star point is earthed. Yy0 would indicate 0° phase displacement between the primary and secondary red phases on a star/star transformer. Dz6 would indicate a delta primary interconnected star secondary and 180° secondary-to-primary voltage vector phase displacement. The system designer will usually have to decide which vector grouping arrangement is required for each voltage level in the network. 1. Vector displacement between the systems connected to each winding of the transformer and ability to achieve parallel operation. 2. Provision of a neutral earth point or points, where the neutral is referred to earth either directly or through an impedance. Transformers are used to give the neutral point in the majority of systems. Clearly in Fig. 14.16 only the star or interconnected star (Z) winding configurations give a neutral location. 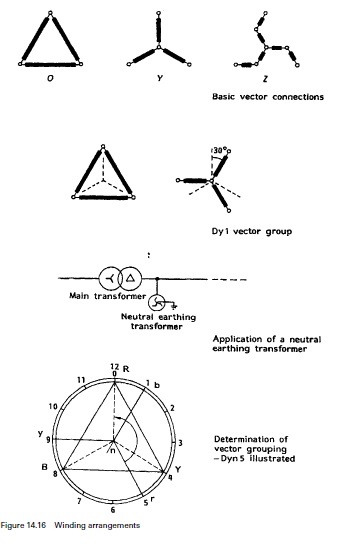 If for various reasons, only delta windings are used at a particular voltage level on a particular system, a neutral point can still be provided by a purpose-made transformer called a ‘neutral earthing transformer’ or ‘earthing compensator transformer’ as shown in Fig. 14.16. 3. Practicality of transformer design and cost associated with insulation requirements. There may be some manufacturing difficulties with choosing certain winding configurations at certain voltage levels. For example, the interconnected star configuration is bulky and expensive above about 33kV. Of considerable significance in transmission systems is the cost and location of the tap changer switchgear. 4. The Z winding reduces voltage unbalance in systems where the load is not equally distributed between phases, and permits neutral current loading with inherently low zero-sequence impedance. It is therefore often used for earthing transformers.